At just 155 cm (5 foot 1 inch), Jim Bradford was Collingwood’s smallest ever player, and still believed to be the shortest ever to play in the VFL/AFL. No surprise, then, that he was known as ‘Nipper’ throughout his entire career. And while that didn’t last too long with the Magpies, he still carved out a wonderful playing CV at Collingwood, North Melbourne, Camberwell and with West Torrens in South Australia. That career started when Jim Bradford ran out for his first game for Collingwood in the Round 8 game against Melbourne in 1943. He had only turned 17 a few months earlier and was still growing, but must have looked little more than a kid that day to the 5000-strong crowd at Victoria Park. One source listed his size after his debut game as 152cm (less than five foot), though he is registered in official league records as being 155cm. The height issue alone made Bradford stand out in his Collingwood debut game. But his impact was much more than as just a curiosity. He kicked four goals on debut, more than anyone else on the ground, and was named among the best players. He showed in that first outing the uncanny goal sense and speed that would come to define his career. It is not known if that report is accurate. But officially Bradford is listed as the second lightest player to ever take to the field, at 53kg, behind Essendon’s George Shorten (51kg) from the 1920s. “Nipper’ Bradford did not kick a goal the following week against Fitzroy, but slotted through two more against South Melbourne in his third game. Bradford was dropped for the next game, and sent back to the reserves once more. He returned in Round 13, and kicked three successive bags of three goals. By the end of his first season he had kicked a highly creditable 16 goals from his seven games. But remarkably, that’s where Nipper’s Collingwood journey pretty much ended. He tried to cross to Essendon in 1944, believing Lou Richards’ presence was stopping him from getting time as a rover. 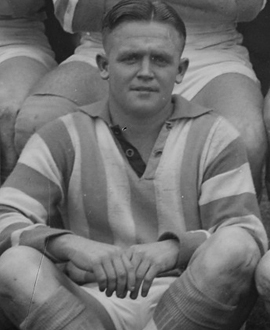 After a season spent with the seconds, he then crossed to Camberwell in the VFA for four seasons, winning best-and-fairest awards in 1945 and 1946, and he was his club’s best player in the losing Grand Final in 1946. Bradford was a star in the VFA, playing 76 games and kicking 169 goals. He was considered “one of the cleverest rovers in Association football” and “the idol of Camberwell.” In 2005, Bradford would be named first rover in Camberwell’s team of the century. He was also a fine cricketer – “a dogged left-hand bat” – playing for Camberwell at the same time. Such was his success in the VFA that North Melbourne offered him the chance to come and train with the club in 1949 – and he accepted the invitation. Barkman never got through his first training session; Bradford went onto play the first nine games with North Melbourne in 1949, kicking eight goals along the way, including two goals against his former side Collingwood in Round 1. But the opportunity was only fleeting and the part-time footballer and full-time foundry worker headed back to the reserves. A fan favourite, sometimes dubbed ‘Mighty Mouse’, Bradford played 76 games with West Torrens between 1950 and 1954, kicking almost 200 goals. It was some journey for the kid from Abbotsford who kicked four goals on debut for the Magpies.